Posted on Wed, Mar 21, 2012 : 5:32 p.m.
Trey Burke, right, led the Michigan basketball team to a share of its first Big Ten title since 1986. He also was named Big Ten Freshman of the Year after averaging 14.8 points per game and set a freshman school record with 156 assists. Trey Burke is going to take a look at his NBA future. As of right now, he's still very much a member of the Michigan basketball program. As first reported Wednesday by the Detroit Free Press, Michigan's freshman point guard will seek advice from the NBA Draft Advisory Committee to determine what his draft status might be should he declare. Burke's father, Benji, confirmed the news to AnnArbor.com. "We had got some information earlier about applying and seeing where his status was in the draft," Benji Burke said. "So that's what he did, just to see where he's at. "There are a lot of things out there that are saying he could be a first-rounder, so he thought it'd be in his best interest to at least solidify that information. ... That's all, he wants to know more, he wants to see where he's at. He knows right now that he's probably as hot a point guard prospect in college as he may ever get. He just wants to see what happens." Benji Burke said he and his family decided to explore the possibility after Michigan's season ended last week in a 65-60 loss to Ohio during the second round of the NCAA Tournament. From there, he said the family spoke with Michigan coach John Beilein about the situation and moved forward. Benji Burke says he and his family have received information from personal sources that Burke could possibly be selected as high as the No. 18-24 range of the first round in this summer's NBA draft. The deadline to declare for the NBA draft is April 29. However, the deadline for underclassmen to withdraw from the draft and maintain their college eligibility is April 10. As of now, nothing's final. In fact, it seems the freshman floor leader is currently leaning toward staying for his sophomore season. "We figured we had to at least see what's going on," Benji said. "That's where we're at. We're wanting to see where we're at and go from there. "Trey just got to Ann Arbor. We just got here, and now we're talking about him leaving. It's just tough, it's a tough decision but hopefully we'll be back in Crisler this year. ... As of now, we're coming back. But anything can change. We're open." Burke finished his freshman season as Michigan's leading scorer, and was the co-recipient of the Big Ten Freshman of the Year award. The 5-foot-11-inch Columbus native averaged 14.8 points per game last season, and set a freshman school record with 156 assists. Should Burke leave, it'd be the third straight year the Wolverines have lost a player early to the NBA draft. Manny Harris departed the school before his senior season in 2010, while Darius Morris left after his sophomore season in 2011. "Right now, we'd love for him to come back," Benji said. "We'd both love for him to come back and get another year closer to his degree. I think he's in a great situation at Michigan. "As of right now, we would hope that he comes back, that's what we're leaning for. But at the same time, I have to be a dad and steer him right and support him. How do you tell a 19-year-old kid he can't inquire about (the NBA draft). It's very tough, and this is probably going to be one of the toughest decisions he's made in his life." Thu, Mar 22, 2012 : 10:24 p.m. Funny! Oh well, back to the bottom of the BIG you go. Look at the bright side you still have Tim Softaway! Thu, Mar 22, 2012 : 2:49 p.m. The University of Michigan is an academically demanding school. Knowing athletes at UM and other Div I programs, I am consistently awed by our athletes' time demands beyond academics: Conditioning, camps, practice, travel, games, media attention, and peer attention. The media and fanatics clamor more, more, more. . . More games, more tournaments, more championships. . . These same parties focus intense criticism and review on minute details of every player's performance in every game. Perfection is demanded and expected from our kids! Our student athletes are students first. We encourage them to advance their educations to the highest levels, wishing them great success in their futures. However, given academic expectations and pressures at a demanding university, no one should be surprised that some of our student athletes seek opportunities elsewhere: other schools, professional sports, etc. Thank you Mr. Burke for attending the University of Michigan. We have enjoyed your contribution to our academic and sport campuses. We wish you the very best of luck in your future, regardless of your pending basketball decisions. We hope that you continue your academic pursuits, attaining your BA, and advanced degree(s). Well it's clear he won't be ready for another couple years, and I'm not particularly worried that he's going to jump ship now. The worrying part is the people whispering in his ear; he needs to seek out some better guidance. Thu, Mar 22, 2012 : 4:04 a.m.
60% of NBA players are bankrupt within 5 years and 78% of NFL players are bankrupt within 2 years. Benji and the family want the bling. Thu, Mar 22, 2012 : 3:22 a.m. I'm still mulling over between whether rationalizing that a player should always go for first round money rather than staying... or that next year's recruits are awesome...of which is the greater sign of desperation among the fanbase. Thu, Mar 22, 2012 : 1:13 p.m.
Thu, Mar 22, 2012 : 2:22 a.m.
No matter how glitzy you make the new arena (center? ), without the ability to recruit and keep competitive talent, viewing Michigan basketball will not be an attractive option. David Brandon and company better rethink their new season ticket policy. Empty seats and a losing team will be pretty ugly, no matter how attractive the venue. Reading between the lines--I'd be shocked if Burke was back for another year. I understand the due diligence in exploring options, and I totally understand the appeal of the money, but college just offers so much chance to grow up with people your own age, to mature, and in an athlete's case, a place to develop your skills well without getting raked through the coals like in the NBA. The NBA is a business--if you are not a high draft pick, NO team has loyalty to you, and you potentially sacrifice millions upon millions if you are not a top 10 pick. So, sure, you may get a big salary next year, but you will never ever make that up if you play for 5 years or so. What a sad day after a sad week or 2 in Michigan basketball. Is junior next? Thu, Mar 22, 2012 : 1:28 a.m.
News in. It's a done deal. He's going pro. College basketball ain't what it used to be. How's a kid go from a lowly ranked recruit to a first round prospect in one 14.8 ppg season. Ok he set a freshman record for assists. Emphasis on freshman. Glad I stopped watching NBA basketball years ago. Thu, Mar 22, 2012 : 1:17 a.m.
You can take the boy out of Columbus but you can't take Columbus out of the boy! Trey look at your last three games and tell us your ready for the NBA. Love his year this year but c'mon. Thu, Mar 22, 2012 : 12:56 a.m.
Thu, Mar 22, 2012 : 12:05 a.m. If, I say if, a player is deemed to be a first rounder, you can't criticize him for jumping on the opportunity. Thu, Mar 22, 2012 : 3:25 p.m.
Thu, Mar 22, 2012 : 3:17 a.m. I'm guessing about 200 college kids are deemed first rounders by one analyst or another. Sometimes, it is too good to be true. robot must be an MSU fan. Other than that sounds like daddy is in a hurry to cash in on Trey's success. Wed, Mar 21, 2012 : 10:28 p.m.
Thu, Mar 22, 2012 : 1:48 p.m.
FYI: Manny Harris just signed a season long contract that will probably be renewed next season. Darius Morris is a rookie and he is not expected to play substantially this year. Why is it that college players can signed a professional contract to play baseball, or a swimmer can use UM practice facilities to hone his skills but a basketball player or football player cannot profit off their skills. 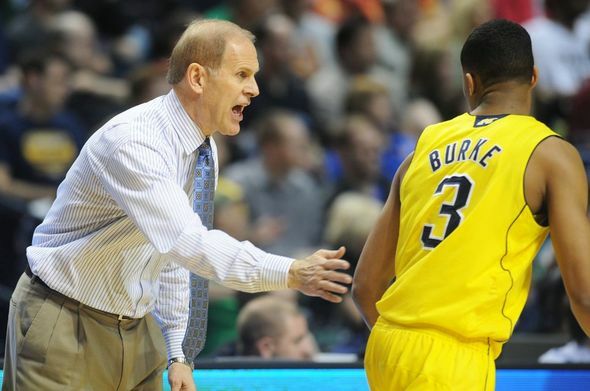 I guarantee if Beilein got an offer for more pay at another school he would at least consider it if not take the offer. Why is it that if a black player listen to his father or depends upon his father for advice his father is somehow using him. This is the same that was said about Darious and his family. Have people come to view all black male athletes as fatherless so the only the person(s) they must listen too are others? Evan was one of my favorite players and I hate to see him transfer, but something is strange in the water up there. Wed, Mar 21, 2012 : 10:22 p.m. Wed, Mar 21, 2012 : 10:14 p.m.
Is Corey Person coming back next year? Wed, Mar 21, 2012 : 10:07 p.m.
Wow- there's water in the leaky boat in Ann Arbor. Looks like the ship is going down fast.